It’s been a very long time since I’ve done any Then And Now articles. I think part of the problem is that I’ve wanted to do them right, so I haven’t done any at all lately since I didn’t feel they’d be up to my standard of quality. I need to get over that. There’s nothing wrong with a quick and dirty Then and Now, so I need to get over myself. Especially now that summer is here, and it is prime picture taking season around Carson City because all the trees are green. I only have a couple of months to get out there and rephotograph all these old pictures I have. Today is the first of what I hope to be many upcoming Then and Now articles. 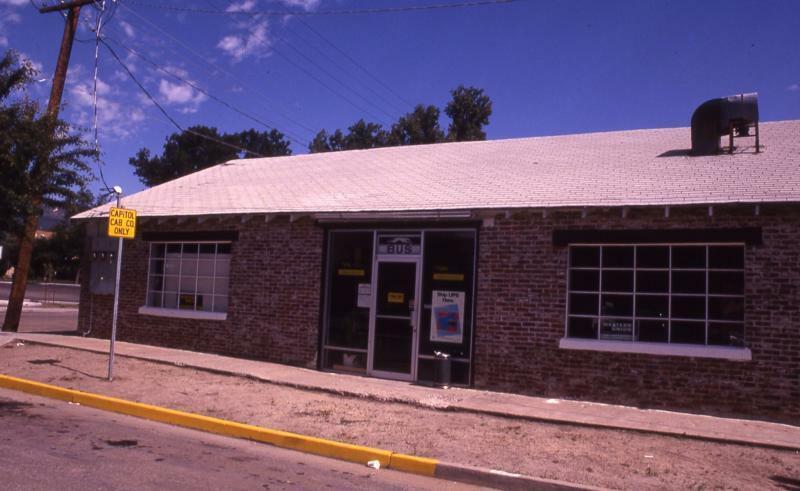 I had this picture submitted to me at the WNHPC, and I had no idea where it was, what it was, what part of town it was in, if it was still standing, anything. It wasn’t until a comment came in from Dwight Millard (of Millard Realty, and my boss about twelve years ago, even though he probably doesn’t remember me) letting me know where it was. I schlepped down there to check it out, and wow have things changed. It’s the same building, though. Check out the article to see what it is. Maybe it’s just me, but the rafters on this building look very similar to the rafters in the building on the far right of the “Traveler’s Hotel” photo. It’s probably the same building. The north side of Third has one long row-style building stretching along the whole block. Here we’re seeing the west end, in the Traveler’s Hotel photo we’re seeing the east end.